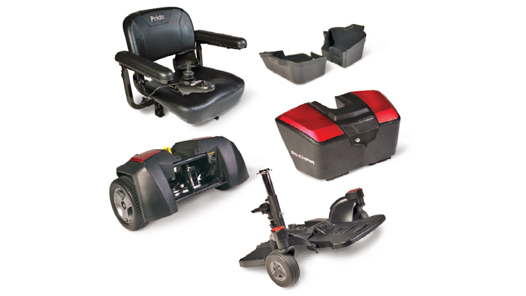 The Go-Chair from Pride Mobility is a power chair unlike any! Easy to remove battery pack and compact, lightweight frame easily disassembles for easy travel and portability. Features twin motors for traction and precision handling and a new top speed of 3.7 mph and enough power to get you where you want to go. 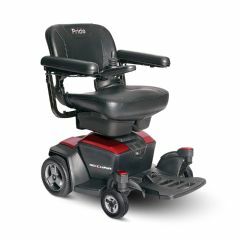 The Pride Go-Chair features twin motors for traction and precision handling in tight spaces. With a top speed of 3.7 mph, you will get where you need to go! Into 3 Pieces For Easy Transport! Please contact our customer service department with your model number, serial number, and any other relevant information to assist locating the proper replacement part for your product. Bet you can't catch me!! Very easy to learn to use. Very comfortable!. Arms raise easy in!. Handles smoothly!. Brakes fast!. Wish I had it sooner!. Broken arm. Spinal cord injury. Loss of balance!. Broke my arm and push rolling walker in circles so I bought this Go chair. It's great. I can go shopping and visiting with my family and they easily put chair in their small car. I am one of the family in every way now. I will continue to use when my arm heals since it's so easy to carry in the car and take to the mall. Can this chair be pushed manually if necessary? CAN I GET A POWERED CHAIR? WHEN? The heaviest piece weighs 35 pounds. It easily goes in the trunk of our car. I have taken the G0-Chair on airplanes and cruise ships. It is light enough to go on a cruise ship tender. Soon I'll be taking it on Amtrak. Can you lower and raise the seat? The Go-Chair Travel Power Chair's seat, armrest and foot platform depth are all fully adjustable and can easily be re-positioned. Does it have a swivel seat? Do you sell any arm shields/guards that would fit on the arm with the joy stick, so that the control arm can't slip off?